The Lexus GS F sedan, after months upon months of rumors and teasers, is finally here, and it'll be making its public debut next week at the North American International Auto Show. 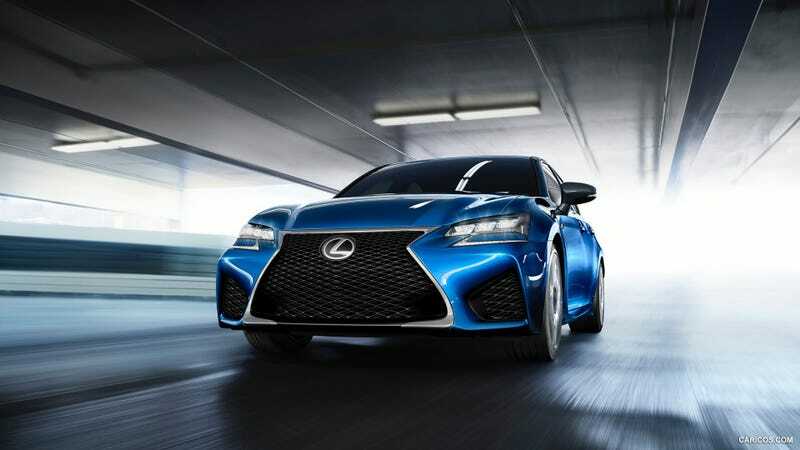 While the 2016 GS F is based on the standard GS sedan, it actually has more in common with the RC F coupe. That includes things like the sporty styling cues (more on that in a minute) and the engine. Speaking of which, I should mention that Lexus has gone and plucked the 5.0-liter V8 straight out of the RC F and stuck it right into the GS F's engine bay. 467 horsepower and 389 ft-lbs of torque will spin the rear wheels through an eight-speed automatic gearbox. Visually, the GS F looks like a cross between the GS and the RC F, featuring a design that looks mean and aggressive while also having four doors. Large front air dams, LED headlights, and a bold rendition of Lexus' spindle grille make up the front end, while grey and black wheels lead backwards towards the rear of the car, which is highlighted by signature quad exhaust pipes. Plenty of F badging is also included. On the inside, most of the interior of the normal GS is retained, with the main differences being the addition of two-tone leather sports seats with F stitching and aluminum and carbon fiber accent trim on the dashboard and doors. Because it's larger and has twice as many doors as the RC F, you'd think the GS F would be ridiculously heavy, and certainly a lot heavier than the RC F. Lexus has somehow managed to keep weight down, though, so the GS F is only slightly heavier than the two-door car that it shares an F model range with. Total weight is quoted at just over 4,000 pounds. As previously noted, the 2016 GS F will make its public debut at the 2015 Detroit Auto Show, where it will share the Lexus stage with another new model, likely a redesigned RX crossover.